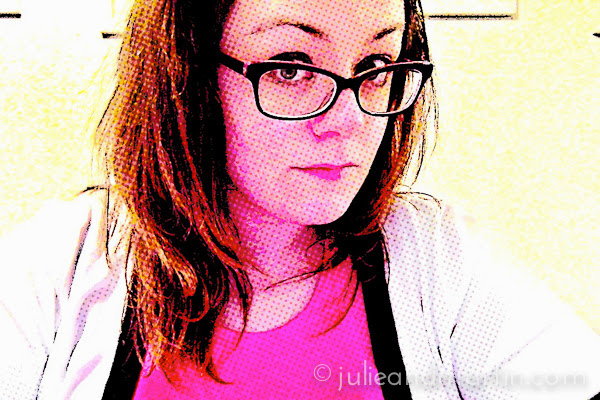 It says this is the “comic book” filter, but I think it looks like a rash. We live in a bowl. The hills around our village are so perfect and round, it’s like an ice cream scoop was used to carve out some space for humanity in the middle of rolling farmland and forests. It’s a bowl. And inside this bowl, there’s the church and all the farmhouses and fachwerk houses nestled together, creating a cozy, adorable community while cows and sheep graze on the outskirts. It is a picturesque dream to live here. 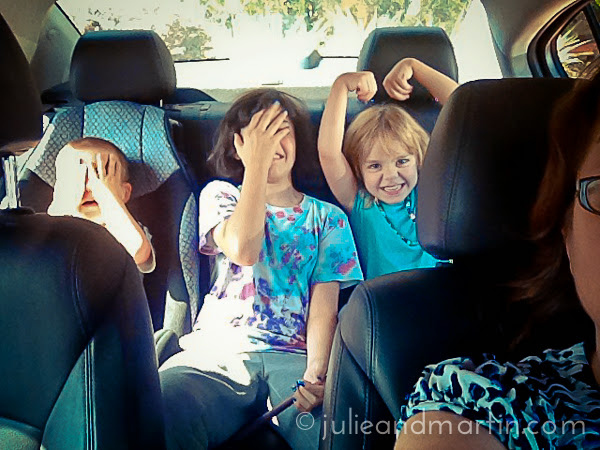 My three monkeys during our trip to Florida last week. It is fitting that today is Labor Day, the final summer holiday, because there’s definitely been a sense of finality around here. For one, I’m finally sitting down to blog. 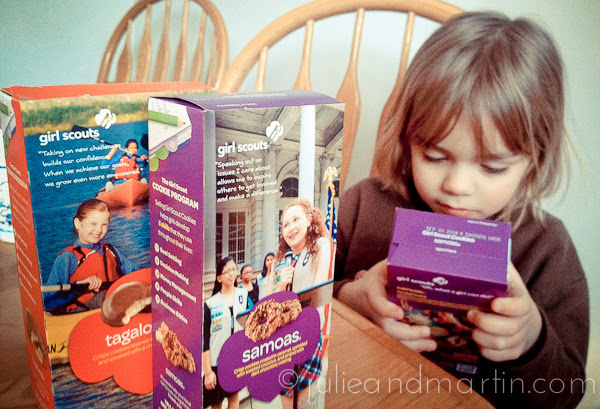 It’s the season for blizzards and Girl Scout cookies, both doing their due diligence to wreck my diet and fitness routine. We put in two orders with two little friends, a mix of chocolate, peanut butter, coconut, and minty goodness. It’s tradition. The kids with our friend Janet just before we left to return to Virginia. Her dog Romeo looks a little left out, doesn’t he? In the midst of all the snow storms, snow days and military training delays and this website revamp, I took a few days off of work and the whole family drove to Michigan for a long weekend last week. I still feel like I’m catching my breath from that awesome whirlwind of the visit, and I’m still sorting through all the images, especially since Miss C took her new camera and took dozens of photos herself. I would like to state for the record, too, that my girl has some pretty awesome photography skills. 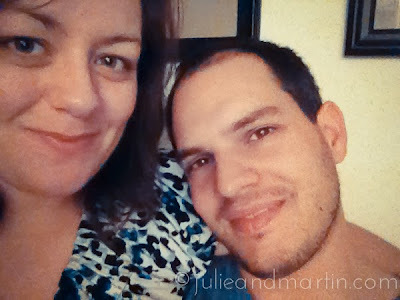 I’m still settling into our new blog home. Archiving, repairing broken links, reposting video content that got dropped from the archives during the move, etc. It’s totally thrown me off my content calendar, but I anticipate returning to my regular posting schedule soon. Just in case you haven’t noticed, the website received a makeover over the past two days. The result that you are seeing is a combination of long-term planning, short-term researching, and impulsive decision-making. I intended to introduce it all with a little more fanfare and advance notice, but as it goes in life, things don’t always happen as scheduled. But this is a good thing. Martin and I had an opportunity to improve the look and feel of the site, and how we manage it on the backend, so we took it. And I’ll explain more about it on an upcoming Blog 101 post, which will resume next Wednesday. As with all moves and redesigns, we’re still getting settled and making sure everything is where it should be, doing what it should do. But you’ll see via our archive page and categories that all the content from the past 12 years is still here. We hope you’ll enjoy the new look and features. We’ve tried to make this site easier to navigate, and easier to engage with us more directly either through social media or in the comments. As always, we appreciate feedback and hope you continue to check in on us here at julieandmartin.com. My video chat with Elizabeth Soutter Schwarzer‘s writing scholars at Harvard on Wednesday night went very well … right up until Skype blitzed out. She just invited me back this evening so I could continue the conversation about writing and blogging, sharing my experiences relating to creating an online presence, how to write to be found using SEO, and how this simple family blog has paved the way for a lot of things for our family. 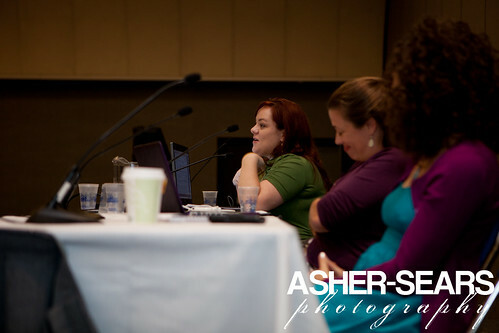 That’s Elizabeth in the middle, amused, during the BlogHer ’11 conference. I first met Elizabeth when we co-hosted a writing class at the BlogHer ’11 conference in San Diego. I was super pregnant (Jaz was born two weeks later), a newcomer to that particular blogging community, and trying not to breathe too loud in the microphone. She was witty, radiant, and a published author/popular mom blogger and former NASA intern/Congressional press secretary who also taught writing classes at Harvard. NASA and Harvard, you guys. I was waiting for the blogging authorities to come in and point out that I had no business sitting next to her, but that didn’t happen, and we clicked immediately. We stayed in touch, and last year, she asked if I could speak to her class about my blogging experiences. That experience went very well, her students were great, and I was asked to do it again this week. Because I was doing this remotely from the corner of my living room, Martin helped me set up a “safe zone” in front of our bookshelves so I would look smart. Then, just before I went live, he rounded up all the kids and barricaded himself with them in our basement to watch a movie. Our aim was to create a webcam frame that projected a quiet, sterile, professional environment here in our home. Meanwhile, during the class, Elizabeth sent me photos of how I looked from her classroom, to include a photo of my cats waltzing in and out of the living room behind me. At least it wasn’t a streaking child, am I right? All in all, I think it went well. Ashley sat next to me during this evening’s class, just to listen and see what it was like, and gave me a thumbs up at the end, assuring me that it went well. I’m always my worst critic, though, and I always think of a dozen things AFTER that probably would have been more beneficial to them. But hopefully, I was able to offer some helpful information to her students, and shed some light on life as a blogger/writer, and give hope that if they are really serious and committed to writing, the opportunities *will* come to them. And remember: you don’t have to be a student to get my blogging advice. You can always check in HERE every Wednesday to learn something. Of course, when I say that, I mean the furlough. And of course, I’m being sarcastic. I’m sure you’ve heard by now that the furlough is over. And for me, it was awful. It was not a vacation, though a few folks kept pointing out that “at least you’ll get paid later! It’s like a paid vacation!” But it was the farthest thing from a vacation for me. Here’s the truth: I did not trust Congress to agree on retroactive pay for federal workers. Even though they said it would happen, I did not believe it. Which is unusual, because I’m normally a pretty optimistic person who believes things usually work out for the best, who can usually see the silver lining in just about anything. But I still applied for unemployment. As the sole breadwinner with no other income coming in? That weighed on me so hard. And I did not trust that Congress would reach a decision on the debt ceiling, and I sincerely anticipated a very bad financial situation for everyone. Not just federal workers and those directly affected by closed government programs and parks … I mean everyone. And then to see all the hatred and negativity on the Internets and in the headlines … I’m sure you saw it, too. I don’t need to re-hash it. I did my best to avoid it. It was just ugly. And demoralizing. On top of that, during those weeks, Martin had surgery on his hand. He’s now in a full arm cast as it heals. I tried my best to be a good nurse to him, but I realized fairly quickly that I don’t have enough patience to be a very good nurse to a grown man who refuses to take his pain meds, but insists on letting everyone know (many times) how bad the pain is making him feel. And I got bit on my toe by a mystery bug (most likely a spider), and my entire foot swelled up and now I’m on antibiotics as it heals. For awhile there, I had only one good foot and Martin had only one good hand, and the kids were running the place. Upon my return to work on Wednesday, there was a meeting where we were asked to go around the room and mention something positive we did during the furlough. I couldn’t bring myself to be Pollyanna. 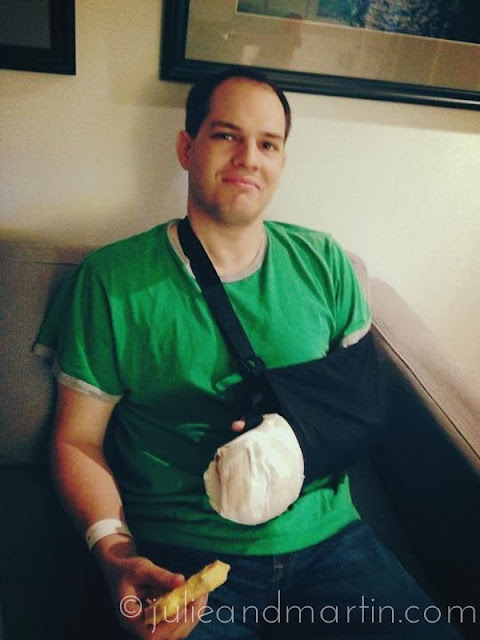 I mentioned the German-American celebration, but I also mentioned Martin having surgery and me being bit, and how everything we did had a cloud of dread hanging over it. I had to be honest. Those three weeks (to include the week leading up to it as I worried about it) sucked. It was hard to feel upbeat about anything. We barely left the house. I barely changed out of sweatpants. But looking back, I really could have mentioned in that meeting that Martin and I have great friends and neighbors. Not only did they come for our German-American day, but when Martin had his surgery and my foot went crazy, they brought us food and hung out with us and kept my spirits up. I love my posse. And I’m grateful for them. These days? Now I’m back to work. My foot is almost completely healed … just a few more days on the antibiotics … and I’m walking with no issues again. Martin has a follow-up appointment and he’ll soon get out of that cast. We celebrated Martin’s birthday with pizza, we went out to Mount Vernon over the weekend, and I feel like we’re falling into a good routine again. Even better, I feel like blogging again. My thought as I took this photo in 2000? I forgot to point out a special anniversary/birthday earlier this week. This blog turned 12 years old on July 28. If it were my child, it would be going through puberty now. But I feel like blog years are sort of like dog years in that things grow and change rapidly, so in Internet/social media/technology years, my blog is really almost 200 years old. I’m pretty proud of my archive over there. 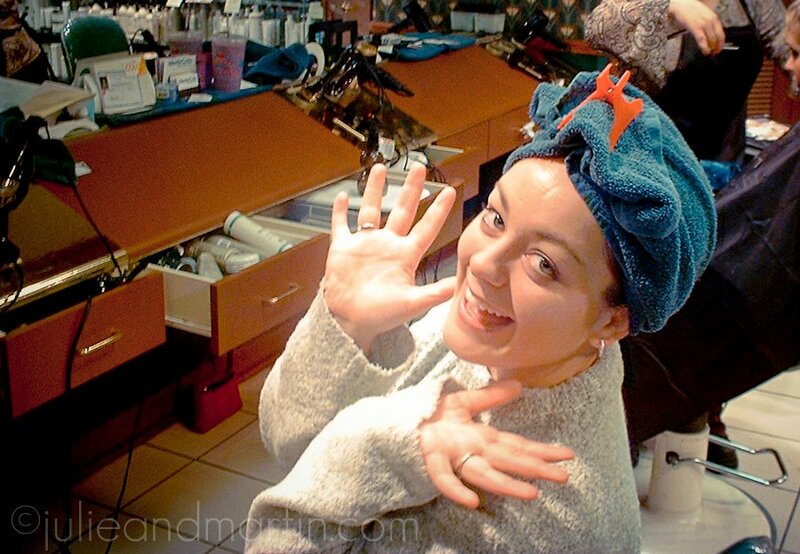 For fun, I’m sharing with you some photos that were taken around the time I first started blogging/recording our history in 2000/2001, as well as the podcast Martin and I created a few years ago about that year. You’ll see skinny Martin. Such a hunk. Oh, and in recognition of my blog going through puberty (sort of), I’m also including one of the most delightful things I’ve seen on the Internet yet. Enjoy. And happy belated blog birthday! Shut up. This was one of my clubbing outfits. Not even joking. There are no other photos of me in this shirt. Grateful there were no cell phone cameras back in 2001. Thank you, Jesus. His and her vehicles. Mine was a 1988 Ford Sierra and Martin had a 1992 Honda Civic. Martin and his mother in fall of 2000, the day he left for Bundeswehr basic training. Love. That. Hair. 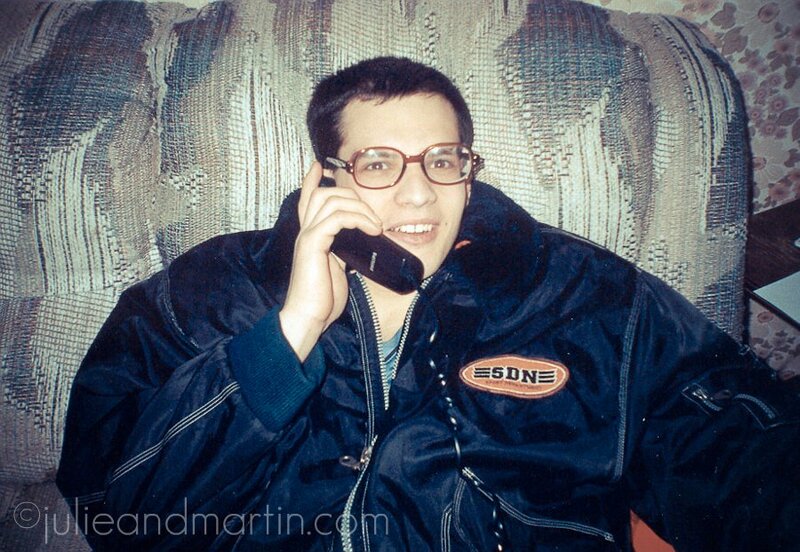 Martin wearing my BCGs — birth control glasses — from basic training while talking on the phone in my Kaiserslautern apartment to my family in the states in early 2001. I can assure you he did not put those glasses on himself. I traveled a lot back then. This photo was taken in Berlin while I was visiting my friend Pam. I found the people in Berlin to be very friendly, although they had a thing for very strange hats. Martin, his sister Carola, my dad, and my ol’ roommate, Stephanie, in Nuremberg in early 2001. Dress shopping in the summer of 2001 while visiting Ohio. That’s Martin on the far right during his Bundeswehr days. Look at those computer monitors. Getting promoted to airman first class! Two stripes! YES! That was in the spring of 2001. On another note, some habits die hard. You’ve seen this before, back when I first hung photos up here. Like most things, it started with a question. It was Miss C who asked it. She was standing in our hallway, reading the wall art I hung on the top of our stairwell. It’s a popular Louise Carey piece on canvas, white typography on black, featuring a long list of recommendations of what it takes to live a good life. I’d seen the piece online via social media, and was pretty stoked to find the artwork for sale in a local home goods store. I usually don’t like text on my walls, but I’ll make an exception for a good canvas. The location is a bit strategic on my part: it now hangs in a place that everyone must walk past every day before descending past photos and portraits representing more than a few of the sentiments expressed in the art. It’s meant to be food for thought. My daughter was a little incredulous, though. “Are you suppose to do all those things in a day?” she asked me. I laughed and explained that would be one incredibly busy day. What if we did set out to do all those things? Not in a day, of course. But wouldn’t it be fun if we actually made a deliberate attempt to DO all the things listed here? If we — as a family — made a concentrated effort to accomplish these recommendations one-by-one? To turn sentiments on a mass-produced piece of artwork into something tangible? And as my brain wheels were turning, I was reminded of all the posts we received during our Guest Blogger Series, and how a lot of those related very well to this sort of thing, with the stories about setting goals, and moving through life with purpose and kindness. That’s how the idea was created, and when I explained it to Miss C, she agreed it was pretty awesome. As a family, we’re going to set out and DO something tangible for every one of the recommendations put on that piece of artwork. There are 34 of them, but some of them are repetitive, such as “be grateful” and “be thankful.” Some of them work better partnered up with others. Some of them may be a little tricky to apply as a tangible experience, but we’re going to try, and that’s going to be the fun part. We’re going to shoot for at least one post about this every week. As for the Guest Blogger Series, we’re inviting our readers to submit their own stories relating to the sentiments expressed on this artwork, too. We want to hear stories about how you fell in love … how you dreamed big … how you never gave up … how you embrace change or pursue your passion. Or rather … the wall art. Submissions don’t have to be long essays, either. We’re game for photos, poems, and video, too. Let me know if you would like to participate in this with us by sending me a note using the CONTACT US link, and I’ll send more information on how to submit. Oh, and did you notice another one of those sentiments? Friday commute home on the Metro, listening to my Led Zeppelin playlist and looking forward to a sizzling hot and busy weekend with the family. It wasn’t quiet at this moment, obviously. It was pretty quiet for a little while. It was quiet on the blog. And it was quiet at home all last week which could only mean that there were no kids in the house. It was true: Martin and the kids and Patches Der Hund were off in Ohio and enjoying two weeks of summer vacation while I got to stay behind for work. As much as I missed them, I also enjoyed the silence in the house and setting my own pace in the mornings. And all the laundry was done. It allowed me to focus on a few things I’ve been meaning to do for a long time. Like read a book from cover to cover within a few days. Meanwhile, Martin and the kids were off visiting museums, and kayaking nearly every day, and attending barbecues with aunts, uncles, and cousins. It makes me so happy they have these summertime experiences stored in their memory banks now. This week, though, everyone is home and under one roof again, meaning the noise is back, along with the constant hum of activity. Martin served his first weekend of Air Force Reserve duty, and though most of it involved hours and hours of in-processing and introduction briefings, he did get to meet people from his new unit. During the week days, though, he and the kids have been making the rounds: visiting the splash park, the playground, the museums. And the stinky corpse flower at the US Botanical Gardens. We hope you are enjoying your summer, too! They’re smiling because it doesn’t smell like death yet.